Quick and easy gluten free party appetizer. 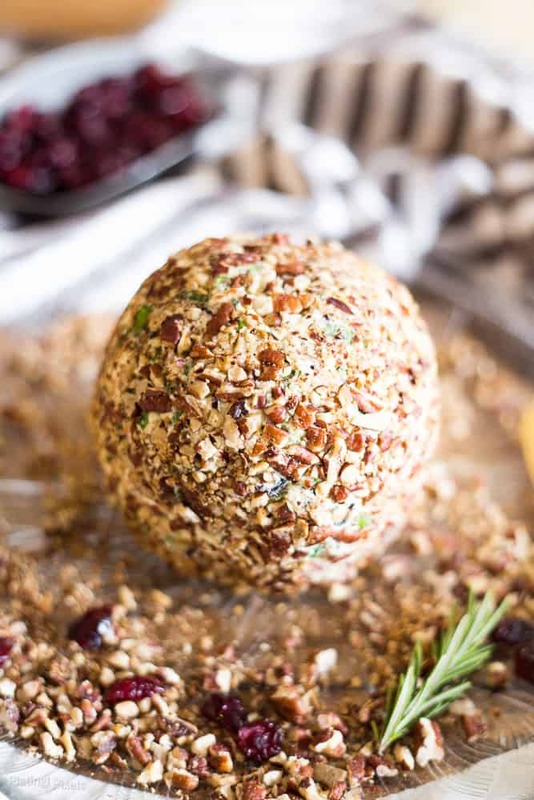 Craisins White Cheddar Cheese Ball made with white cheddar, cream cheese, dried cranberries, parsley, garlic, green onion, rosemary and toasted pecans. Plus you’ll learn a quick trick to soften butter or cream cheese. Sometimes you want a quick and easy party appetizer. 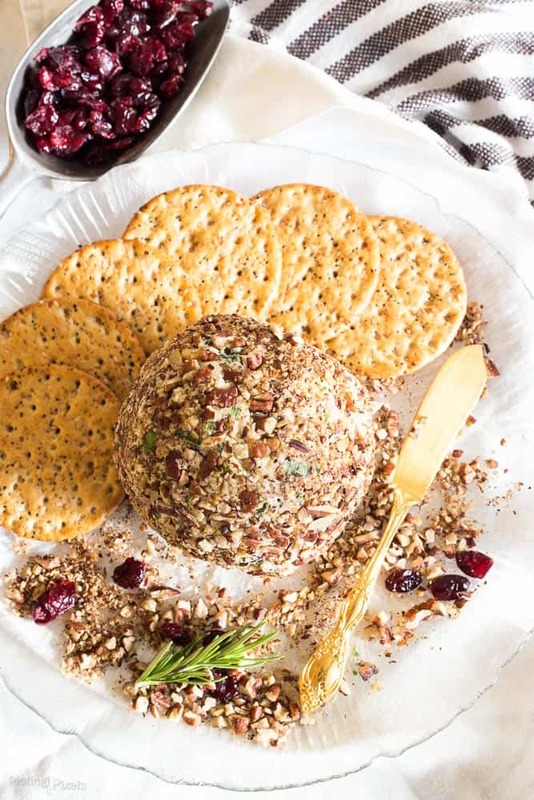 This Craisins White Cheddar Cheese Ball takes about 10 minutes and will be the hit of any party. I visited my parents for the holiday and made this as a starter. After making an extra trip to the store on Christmas day for an ingredient, plus photographing these on Christmas day, quick and easy prep was much appreciated. Be sure to start with softened, or room temperature, cream cheese (more details in the cooking tips below). 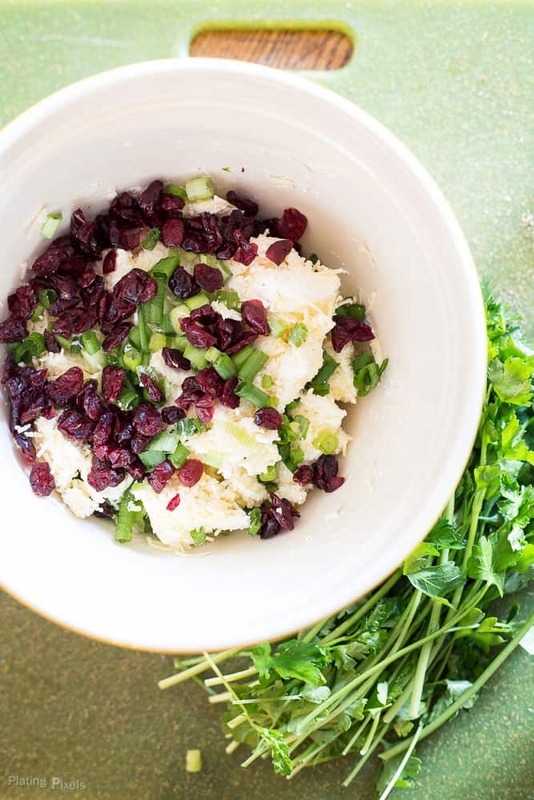 Then mix in the remaining ingredients including craisins, sharp white cheddar, and herbs, and roll into a large cheese ball, which is coated with chopped toasted pecans. This white cheddar cheese ball is so simple and flavorful! Your guests and family will be amazed you made it. A generous amount of fresh parsley and green onions, paired with fresh rosemary and minced garlic is the ideal match for creamy sharp white cheddar cheese. How to quickly soften cream cheese, and what does softened mean? 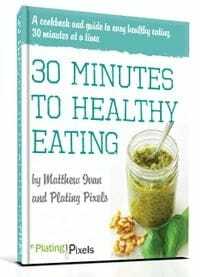 If you’re in a hurry slice it into smaller pieces, about ¼-inch thick, and spread out onto a plate. This will create more surface area to warm up and soften. An even quicker way is to place the plate of cream cheese or butter slices over a stovetop with oven on; be sure the stove isn’t on. This will create more heat, but shouldn’t melt. Recipes often call for softened butter or cream cheese, including this one. Softened means the same thing as room temperature, and that’s the ideal way to soften it. Just let butter or cream cheese sit on counter 20-30 minutes. I don’t recommend using a microwave to soften. It creates uneven spots of soft and firm, and can easily melt butter into a liquid if cooked too long. If you’re having trouble shaping the ball you can place the mixture in the fridge for 5 minutes or wet your hands to stop the mixture sticking to you. White cheddar makes this cheese ball look very festive and impressive but you can also use regular orange cheddar. Sharp cheddar will give the best flavor but you could also try using smoked cheddar, I don’t recommend using a mild one. If you don’t have pecans you could use other nuts such as walnuts, cashews or pistachios. Use high quality or organic ingredients, especially for the cream cheese and cheddar. The taste will be much better. Serve with crackers, breadsticks or freshly toasted bread. 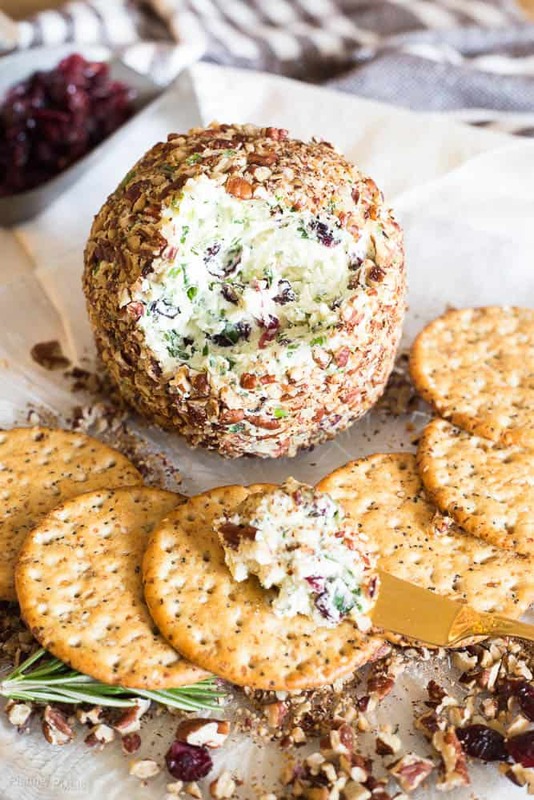 Craisins White Cheddar Cheese Ball made with white cheddar, cream cheese, dried cranberries, parsley, garlic, green onion, rosemary and toasted pecans. Prepare pecans ahead of time: cook in a pan over medium-high heat, stirring often until slightly browned and fragrant; about 5 minutes. Remove from pan and cool completely on a plate. Place all remaining ingredients (except pecans) in a large bowl and stir well until completely mixed. You may need to mix by hand as it will be very thick. Shape mixture into an even ball, about 4-inches in diameter. Roll ball in chopped pecans to evenly coat outside. Serve immediately with crackers or bread. Or store covered in fridge 1-2 days until ready to serve. To soften cream cheese, let sit at room temp about 30 minutes. It will soften quicker if you cut into separate slices to allow for more surface area. If you're having trouble shaping the ball you can place the mixture in the fridge for 5 minutes or wet your hands to stop the mixture sticking to you. A sharp cheddar will give the best flavor but you could also try using a smoked cheddar, I don't recommend using a mild one. Try to use the highest quality ingredients possible especially for the cream cheese and cheddar. It will make a big difference to the end result especially if you're making this for a special occasion. Serve with crackers or breadsticks. My granddaughter found this recipe on Pinterest and made it for an appetizer. She isn’t good at measuring and put about 10-12 cloves of garlic! Which turned out awesome and everyone loved it. Haha that is a lot of garlic but bet it’d be tasty! I always use plenty of garlic in my personal cooking. Glad you like it and thanks for the feedback Diane! I just made this for a New Year’s Day party tomorrow. I think it’s a little too onion-y and a little too much rosemary tasting so I think I won’t use as much next time. Other than that, very tasty! I picked up sharp yellow cheddar instead of white cheddar so I’ll make sure to not make that mistake again. Thanks for the feedback Katie. Have a great New Year! I may need to attempt making one of these. Always love eating them but I have never made one. I love this cheese ball recipe! It’s simple, elegant and delicious. You’ve inspired me to incorporate this as part of a New Year’s Eve spread. Thank you so much for sharing. And now I’m heading over to take a peek at your White Chocolate Cranberry Scones recipe…because it’s always good to have another recipe that can use one or more of the same ingredients. Who doesn’t love a good cheese ball? I like to camp out right next to them at parties. This looks so yummy too. Okay these look AMAZING and your photos are so good! I love cheese balls and that one sounds really good. I am going to try it! I love the inclusion of crasins here, yum! I love craisins! I never would have thought to put them in a cheese ball though! Me too and it’s a great way to flavor a cheese ball. Thanks Angela! I love the idea of this. I wonder if it would work with vegan cheese! I’m sure you could easily replace the shredded white cheddar with vegan cheese. Cream cheese is a big part of the texture and flavor, not sure if there’s a vegan substitute for that? If you know of one I’d love to hear. Thanks Annie! I love white cheddar! Last year I made a craisin and goat cheese cheeseball that was a big hit. I have no doubts my family would gobble this up. I bet a goat cheese one would be so flavorful! I’ll have to try that too. Thanks Jamie!